Tarpa festival is actually a dance festival of Dadra & Nagar Haveli In India. it is celebrated on 26 th December to 31st December every year. this Dadra & Nagar Haveli place is famous for it’s tribe people’s culture and traditions. Kokna and Koli trible people performs this unique dance at this celebration. 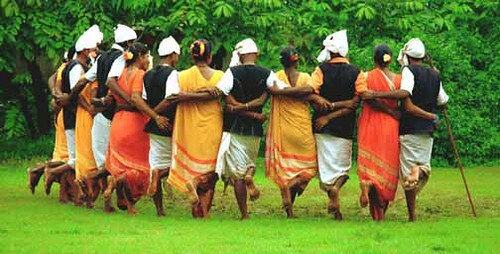 this is a dance where men and women dances in a group by keeping each other’s hand. Cultural programs are organised at night time and events like boat race, tatoo design, swimming and folk dances are also a main attraction point of this tarpa dance festival. A very rare Musical wind instrument named Tarpa is played by people during this dance and you can see this in photo below also.